Setting up A/B/X testing in Survicate consists of two steps. First, you need to generate cookies which will be randomly assigned to visitors of your website. Then use those cookies to target different variants of surveys. We will generate one cookie with a numerous values depending on how many variants you’d like to test. This creates completely randomly picked segments of visitors for your A/B/X test. 1 – 2 is an A/B tests. We will generate a cookie with value 1 and with value 2, so your audience will be randomly split into 2 groups. 1-4 is an A/B/C/D test, your audience will be split into groups of 25% of visitors each. Once you save it, the cookie generation and assignment will be enabled and we’ll start splitting your audience. You need to create website survey for your test now. Create as many surveys as cookie values you’ve picked. Go to the Settings section of the survey and open Who should see your survey? > Create new segment. In How do they use your website? enable They have a cookie checkbox. There you need to input the name of the cookie and the value of it - different for each A/B tested survey. As a result, each survey will be targeted to different segment ot a test. 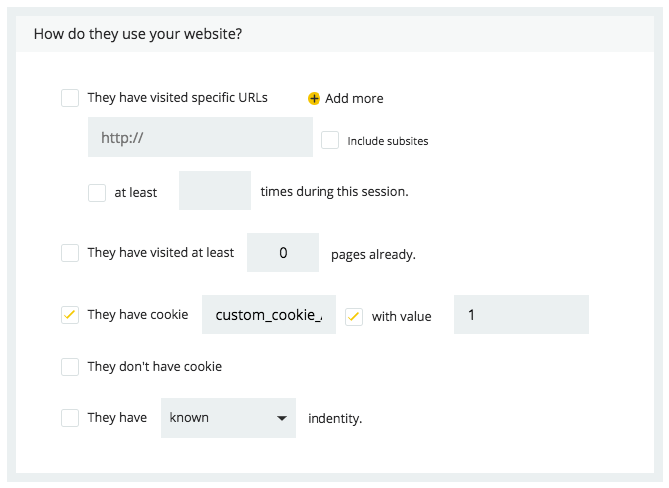 Then create several surveys- each targeted to the different cookie value. That's it!